/ Can You Use Regular Shampoo on Dogs? What May I Wash My Dog With? What If My Pet Sheds? 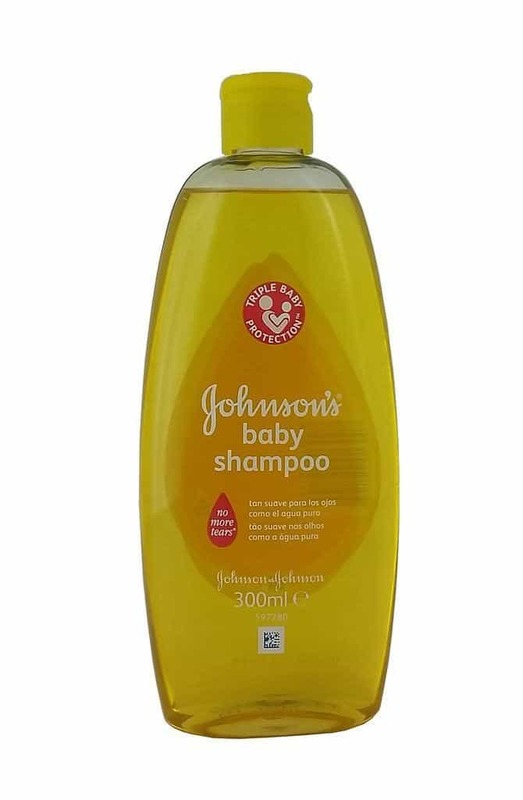 Can I use Baby Shampoo Instead Then? Some of us might grab the bottle of dish soap, or some might get the bottle of shampoo that they use on their own hair. Conventional thinking might lead us to the false conclusion that if using a bottle is safe enough for us to use, then it has to be perfectly safe for a canine. 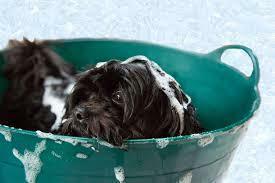 Sure, you may use human shampoo on your dog once or twice without damaging its coat. But we strongly suggest not to make a habit of doing that because doing so may lead to skin and fur problems for your pet long term. Although you may think human hair and skin is similar to a puppy’s, they are different and therefore need different shampoos. 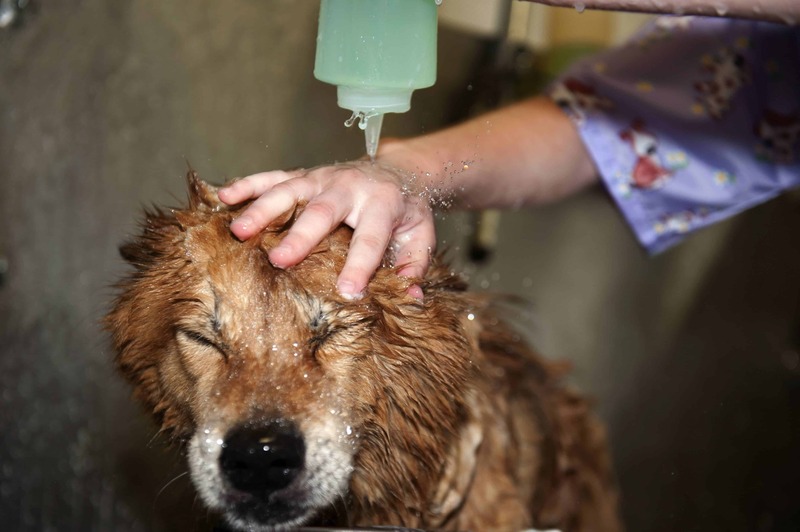 Our goal for this article is to explain why you can’t or shouldn’t use human shampoo on dogs. As we said, you might be able to get away with using human shampoo on your dog maybe once in a while. But over time, if you keep using a one that is not meant for a canine, it may lead to skin irritations or unnecessary shedding. Your dog’s safety is a priority, so use one that is pet safe because the last thing you want to do is harm your dog in any way. First, one thing that humans and dogs have in common is that our skin is protected by a thin layer of acidic oil, referred to as the acid mantle. Remember, in this case, we use the pH scale to measure how basic or acidic a dog’s skin is. Human skin is slightly more acidic, whereas a canines is somewhat more sensitive and neutral, ranging from 6 to 7.5. Therefore, you need a pH balanced shampoo that caters to your dog’s delicate skin. The acid mantle serves as the last line of defense that protects your pet from bacteria, viruses, etc. Using a human shampoo on your dog can be harsh to its skin, stripping it of its acid mantle, which can irritate your pet’s skin, making it more susceptible to infections. As a matter of fact, there are actual shampoos that smell good and are also safe for your dog. Never compromise your pet’s safety for the sake of convenience or because of laziness. Make the time and effort to find a product with a formula that has a pH level that matches your pet’s. Doing so will result in a beautiful healthy coat. As we said in the previous section, dogs already have skin with a lower pH level in comparison to humans. For other dogs, they compound that issue with having sensitive skin. Canines with sensitive skin may have extra dry skin or skin that is easily irritated. Using human shampoo on dogs with sensitive skin can be extremely harmful to their skin, leading to allergic reactions or rashes. 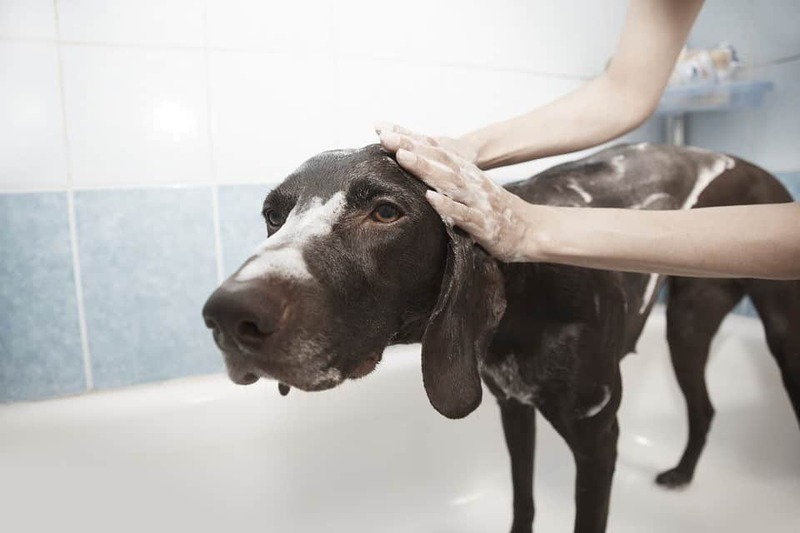 So, we strongly suggest using a dog shampoo specifically for sensitive skin, which should help soothe the discomfort of any itchy or dry skin. Look for a product that is organic or made from all-natural ingredients. 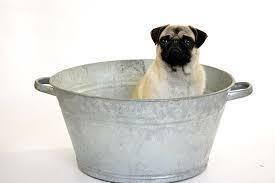 Stay away from heavily scented products that can irritate your pet’s delicate skin. Also, try to avoid products with artificial dyes and harmful preservatives. For example, pet parents I talk to stick to paraben-free products and ones that are free of sulfates. Sulfates are used as foaming agents but can irritate your pup’s nose, eyes, and skin. Instead, look for products that will promote a healthy coat, such as oatmeal, honey, Vitamin E, or aloe vera. In terms of fragrance, look for natural scented items like lavender, or other aromas that will not harm your pet’s coat. Always seek the advice of a veterinarian before committing to a brand. If you haven’t figured it out by now, don’t use human products or dish soap to bathe your dog. You’ll end up doing more harm than good to your pet’s fur. Remember, just because it is safe for humans does not necessarily mean it is right for your furry friend. So what should you use? Any product that is made for the general care of animals or specifically for dogs is a reliable place to start. As long as the label says it is safe to use on dogs, you’re good to go. They have dog product to fit every lifestyle and budget, so it shouldn’t be hard to find the right one for you and your canine. For example, they have products with organic formulas that are free of sulfates and parabens, to treat ticks and fleas, oatmeal-based products, combination shampoo, and conditioner, etc. So, if you notice your pet is not responding well to the product, then seek the advice of a veterinarian and see if you need a product that will better suit your pet’s coat or skin type. Find a brand that you trust and won’t hurt your pet. 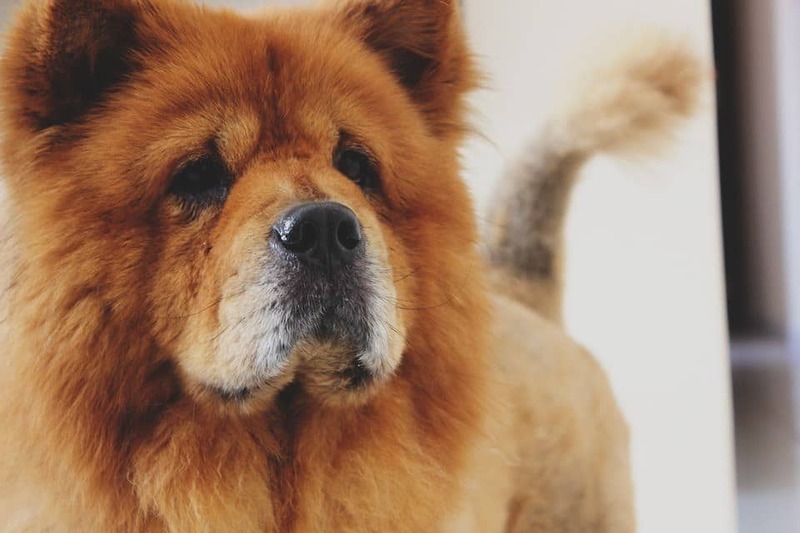 Shedding is a natural process for some breeds of canines. Some shed throughout the year, seasonally, or not at all. It is irregular shedding that you need to keep an eye out for. There are many possibilities as to why your dog is shedding abnormally. Irregular shedding might be the cause of anxiety or stress, allergies, an infestation of fleas or ticks, or an imbalance of pH levels in your pet’s skin. As we said, they make dog products for all types of skin conditions. So, if you notice atypical shedding by your dog, first see a veterinarian so he or she can evaluate the cause of shedding and create a treatment plan. The use of human products on a dog that sheds will only make matters worse. The balanced pH formula moisturizes your canine’s skin to ensure it does not dry out. Before buying, check for essential ingredients that provide relief for irritated and dry skin, such as Vitamin E, oatmeal, and omega 3 and 6 fatty acids. There are shampoos for shedding available online, that provides all the essential ingredients. First off, baby products use a gentle formula. The pH levels in these products for infants are not as acidic as regular ones. Therefore, it is safe to use on your dog. However, try only to use baby products if it is an emergency and there are no other options because nothing can truly replace the quality and effectiveness of actual dog products. So, can you use human shampoo on dogs? Yes, but don’t use it on a regular basis, because it is not safe, and you’ll end of damaging your pet’s hair in the long run. If it’s an emergency and you’re all out of products, then once in a while is okay. 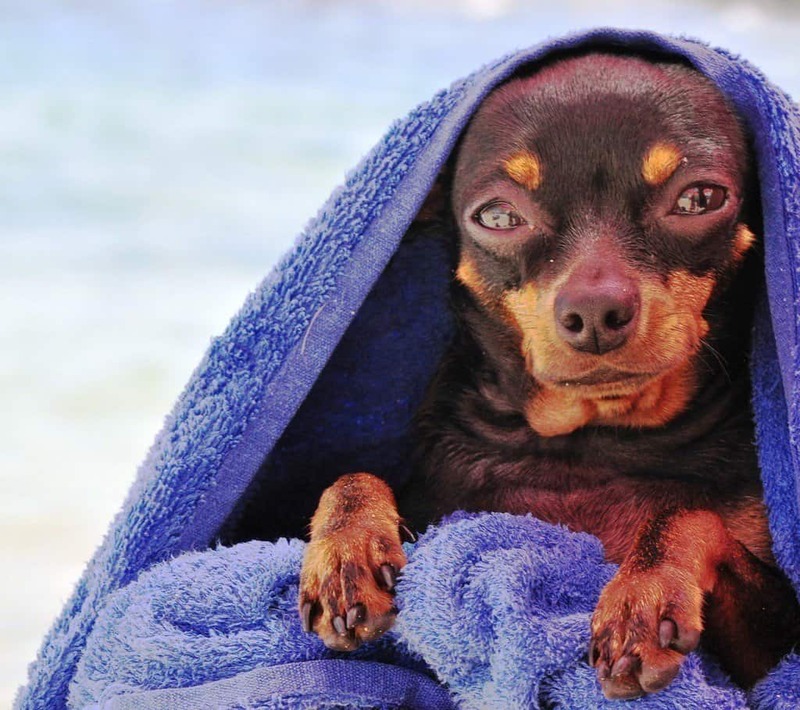 Do it often, and you risk stripping your pet’s skin of its acid mantle, or thin protective layer. Remember that shampoo for a dog is pH balanced for its skin. If your dog has discomfort from sensitive skin or allergies or sheds irregularly, then consult a veterinarian to help you find a product that will promote a strong and healthy coat for your pet. For best results, use a quality dog shampoo from a top-rated brand instead of a regular (human) shampoo.